With the Crusty Plate, you will prepare delicious crispy dishes. Frozen or reheated dishes such as pizza, tart or chicken nuggets will be browned from the top and evenly baked inside. You can also bake and fry without using oil. Microwave oven is distinguished by its elegant, top-quality design, which fits perfectly into any modern kitchen. The clear black Crystal Gloss ™ handle and knob create a polished whole. On the light blue display you can easily read the settings and the current time, which makes the operation of the device much easier. 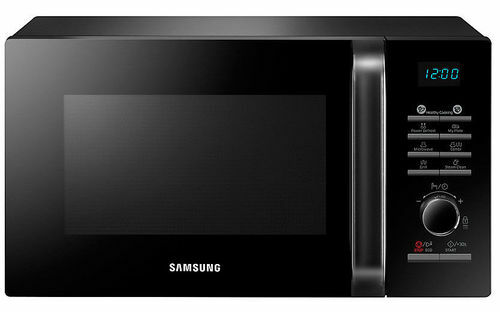 The Samsung MW3100H Grill model has a built-in steam cleaning attachment located inside the microwave. Fill the tank with water, select the steam cleaning function and let the device do its own work. The heated water turns into steam, which then dissolves the food particles easy to remove with a cloth. A rich selection of a variety of fresh and healthy dishes is at your fingertips thanks to 20 pre-defined cooking modes in the Samsung MW3100H Solo / Grill. Prepare easily the most diverse dishes - from green peas through brown rice, to chicken breasts and fresh salmon fillets - knowing that you will get a tasty dish with the right humidity. Fulfill your dreams of traditional flavors from childhood thanks to a rich palette of pre-programmed local dishes available in the Samsung MW3100H Solo / Grill. Now preparing a meal is just one button press, so you avoid a lot of preparation and you will have more time to feast. No scrubbing or scratched surfaces The ceramic interior of the microwave MW3100H Solo / Grill by Samsung provides a smooth surface, easy to clean, which will not discolor over time due to contact with oils or grease deposits. In comparison with stainless steel interiors and epoxidised ceramic chambers, it is both anti-bacterial and scratch-resistant, guaranteeing many years of top quality. Microwaves use a certain amount of energy to maintain essential functions even during periods of inactivity. The choice of the ECO mode in the new Samsung MW3100H microwave significantly reduces energy consumption, translating into monthly savings in electricity bills.